This is it! My search for yarn dyed in the colors of I saw in my drive along the lake at Callaway Gardens. After several test samples on colors, I got the pinks and purples of the flowers in harmony with the blues of the lake and the greens from the trees growing along the shoreline. It’s hard to see all the colors in the twisted skein on the right because there is far less of the flower colors than the others, so I left one skein untwisted on the left to give you more of an idea of the full range of the colors. Each main color was dyed in multiple shades based on the same starting point to try and achieve the soft twinkling colors of the light reflecting off the water. Not to put too fine of a point on it — after all, this is yarn, right? 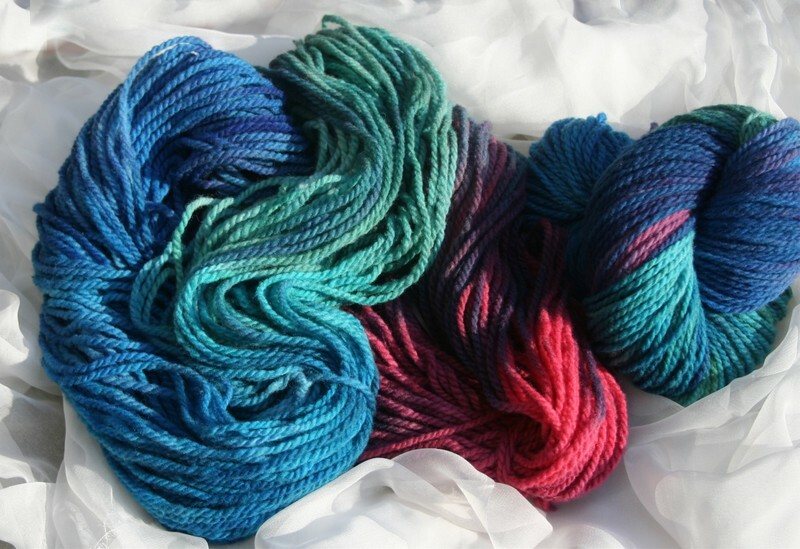 But some of us take our yarn pretty seriously and I wanted a sweater with just the right colors. Your art is beautiful as always. I don’t know if obsessively dying yarn makes you geeky or just an artist. It’s wonderful. Oooooooooh, I love it! So very pretty! Beautiful colors. I posted about callaway gardens yesterday on my blog. Isn’t it a spectacular place. found you through apron thrift girl – so glad i clicked the link. please visit me if you have time. Oh love the new yarn and the new art work have had company since Fri so didn’t get to post!! love this the colors are just lucious!!!!! hope the arm is ok!! !